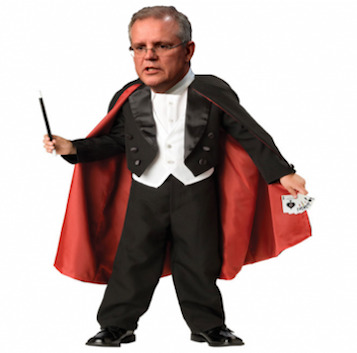 strokeofluck: Morrison the Magician: How to make our jobless and economic ills vanish. Morrison the Magician: How to make our jobless and economic ills vanish. Scott Morrison, the magician, illusionist extraordinaire, has made all Australia’s failing job and economic growth problems vanish in a puff of smoke and mirrors (with apologies to John Passant for stealing his phrase). John Haly reports. TREASURER MORRISON has created a grand facade of jobs springing miraculously from the presumption of Australia’s economically fertile soil. Drought resistant and immune to the emerging heat of anthropomorphic climate change (which was provided with no new solution in the 2016 Budget), our economy is expected to blossom with “Jobs and Growth”. Prosperity is forthcoming to the families of Australia, except for those who are too lazy to earn over $80K a year! Labels: Current Affairs, Opinion, Politics, Strange but true?